In a large nonreactive saucepan, combine the celery, carrot, onion, peppercorns, bay leaf, thyme and 8 cups of water. Bring to a boil over high heat. Reduce the heat to moderately low, cover and simmer for 10 minutes. Add the chicken breasts to the pan skin side down. Place a plate directly on top of the chicken to keep it submerged. Reduce the heat to low and poach very gently for 30 minutes. Remove from the heat and let rest for 15 minutes. Using tongs, transfer the chicken to a plate and let cool completely. Reserve the broth for another use. In a food processor, finely chop the watercress, scraping down the bowl as necessary. With the motor running, add the lemon juice, olive oil, vinegar and 1 tablespoon of water. Transfer to a small bowl. Stir in 1/4 teaspoon salt and season with pepper. In a large saucepan, bring 3 cups of water to a boil. Add 1/2 teaspoon salt and stir in the bulgur. Cover, reduce the heat to low and cook until tender, about 20 minutes. Drain the bulgur and rinse well with cool water. Drain again. In a large bowl, toss the bulgur with the tomatoes, parsley, lemon juice and olive oil. Season with salt and pepper. Skin the chicken with a sharp knife and using the breastbone as your guide, cut off the meat. Thinly slice the chicken on the diagonal. Fan out the cucumber slices in a semicircle on 4 large plates. Spoon the tabbouleh in the center. 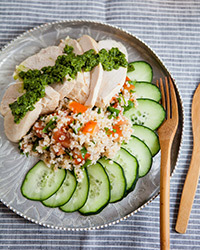 Fan the chicken slices on the other side and top with the watercress pesto. Garnish with watercress sprigs and serve. The chicken can be cooked up to 1 day ahead. Wrap and refrigerate overnight. Remove from the refrigerator about 1/2 hour before serving.